Summation & Relevancy of the Marc Gafni Polygraph Results - Who Is Marc Gafni? In early fall 2007 Marc Gafni asked his legal advisor at the time, to initiate a polygraph test which might help him clear his name of false accusations and complaints. The complaints he was interested in refuting were of two types. First he wanted to refute via polygraph the claim that he engaged in sexual harassment by improperly deploying his authority as well as the claim that he made false promises of marriage or otherwise engaged in deception to gain sexual relations. These were the complaints that according to public reports were filed with the Israel police by three women in Israel. *Addendum from 2014: at the time of the polygraphs, Dr. Barland and Marc Gafni were unaware that the claim made by the parties in question – namely that complaint reports were registered with the police – was in fact false. Not only was the content of the complaints false, but the claim that there were registered police reports was also false. One party was an employee of Marc’s organization, the second was a friend of Marc’s who also came to a number of Marc’s lectures, and as indicated in the email record, was in discussion with Marc about “co-creating” a study process with him. Although the email and instant message record (which has been recovered from Marc’s computer) already falsifies these alleged claims – and thus there is no genuine need for a polygraph – Marc wanted to further strengthen the refutation of the false claims even farther through a polygraph test. The tests were administered in three distinct sessions by one of the leading experts of Polygraph in the world, Dr. Gordon Barland. Dr. Barland’s resume is available at GordonBarland.com. He was a senior lecturer for many years at the Department of Defense of the United States and has trained police forces all over the world in administering Polygraph tests. He specializes in cases relating to sexual issues. The truthfulness of Marc’s claims about these events was validated by the polygraph. On all questions using the most advanced methods of testing, the examiner reported that the results indicated that Marc was telling the truth. 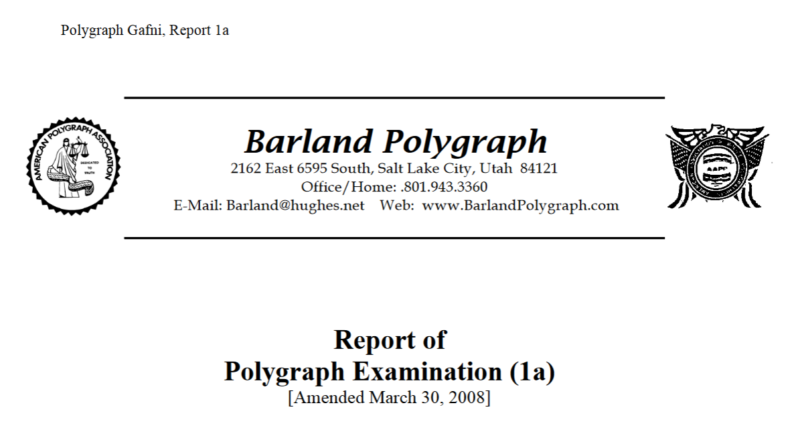 About Polygraph Expert Gordon H. Barland, Ph.D.
Dr. Barland has more than thirty years of experience with the polygraph. He graduated with honors from the federal polygraph school which was the forerunner of the Department of Defense Polygraph Institute. Both his Master’s and doctoral research was on the accuracy of the polygraph. He has examined hundreds of criminal suspects at the request of defense attorneys, police agencies, and prosecutors. For fourteen years (1986 through 2000) Dr. Barland worked at the Department of Defense Polygraph Institute (DoDPI), where he taught countermeasures, conducted research, and provided operational support to various federal agencies. Based upon his research, he developed a 40 hour course on polygraph countermeasures and how to detect them. Prior to his retirement from DoDPI, he was the Federal Government’s primary authority on polygraph countermeasures. For well over ten years, Dr. Barland served annual two week tours of active duty with the polygraph office of the Intelligence and Security Command (INSCOM) prior to his retirement as a Lt. Colonel from the Army Reserve. Dr. Barland has taught psychology and physiology at a number of polygraph schools, including DoDPI, the Backster School of Lie Detection, the University of Houston polygraph course, the Southwest School of Polygraph, the Canadian Police College in Ottawa. In addition, he has presented polygraph instruction or workshops at the FBI Academy in Quantico VA, the CIA, the National Security Agency, the U.S. Secret Service, the USAF Office of Special Investigations Academy, and for the Mexican Government [the National Institute of Forensic Sciences – Instituto Nacional de Ciencias Forenses (INACIPE) and the Centro de Investigacion y Seguridad Nacional (CISEN)] in Mexico City. In addition to numerous papers presented at professional conferences in America, he has also been invited to present papers or colloquia for the Israel National Police in Jerusalem, at Bar Ilan University in Ramat Gan, at the University of Silesia in Katowice, Poland, and at the meeting of the British Psychological Society in Swansea, Wales. He has presented briefings for various Senate and House committees, the Office of the Secretary of Defense, and the White House. In addition, he has published numerous articles in professional and scientific journals, and authored or co-authored two chapters in books on the polygraph. He has testified as an expert witness in over thirty state, federal and military courts. He is currently an adjunct faculty member of the DoD Polygraph Institute and of the University of Virginia.